For a few hours on Sunday, Fenway Park, the cathedral of Boston, was taken over by the cities of Galway and Dublin. The stands were filled with over 30,000 people, all anticipating the festivities. Boston Mayor Marty Walsh, along with AIG Insurance, the Gaelic Players Association (GPA), the Gaelic Athletic Association (GAA), Aer Lingus, and Fenway Sports Management (FSM) brought the ancient Gaelic game of hurling back to Fenway. The last time this game was played at Fenway Park in 1954, more than 60 years ago. The day started with two bagpipe groups, the Brian Boru Pipe Band and the Boston Police Gaelic Column providing entertainment as they traveled the halls under the stands and finally onto the field. Many of the pregame activities were solemn and moving. Included was the introduction of Mayor Walsh along with Patrick Hoarty (one of the players in that 1954 game) and with special thanks being given to several of our wounded warriors with Disabled Sports USA. The rain started coming down early in the day, but this didn’t dampen anyone’s spirits. The audience was then moved by a stirring solo performance by retired Mass State Policeman, Sgt. Daniel Clark, “the “Singing Trooper.” He gave an emotional rendition of not only the Star-Spangled Banner, but also the Irish national anthem, Amhrán na bhFiann, in Gaelic. The game between Galway and Dublin started quickly. For anyone not familiar with the game of hurling, it is like a cross between field hockey and lacrosse, only times ten! “The objective of the game is for players to use a wooden stick called a hurley (in Irish a camán) to hit a small ball, called a sliotar, between the opponents' goalposts.” (Wikipedia) Unlike a lacrosse stick, the hurley does not have a net on the end to catch the ball with, it’s just a flat paddle. The athletes playing the game of hurling seem to defy the laws of physics at will. The game was played fast and hard for 4 quarters. It was a very close game, scores bounced back and forth, and the audience screamed loudly each time, but Galway finally came from behind to win 50-47. 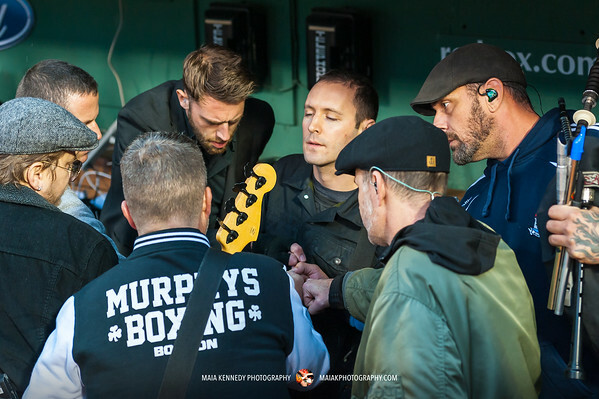 Shortly after the game ended, the favorite Irish punk band of many, the Dropkick Murphys, came out to thunderous applause. This band has strong Boston and Celtic roots, and they never disappoint. Their first song of the day was “The Boys are Back,” a powerful song to burst onto the stage with. The pouring rain didn’t slow this band down and only seemed to give them more energy. Soon everyone was drenched, but the music didn’t stop and the crowd was thrilled. You see many familiar faces at DKM concerts and there were a lot of regulars in this crowd, loyal fans who go to every show possible. The setlist was packed with many favorites, including one for the holiday time of year, The Season’s Upon Us. Even when they were being told to wrap it up, the Dropkicks wouldn’t let their people down and kept playing. They finished their set up with two Boston-themed songs, Dirty Water and I’m Shipping Up to Boston. After the performance, after everyone else from the band has left the stage, you can usually find Ken Casey in the audience surrounded by his fans. He always takes the time to say “Hi,” sign some autographs, and give out a few hugs. On this day however it was raining, it actually started coming down even harder just as the show was ending. That didn’t stop Kenny though, he didn’t seem to mind getting drenched as he greeted all the people waiting for him. Time flies when you’re having fun and the decades have gone by quickly since these guys first started: it’s hard to believe it’s been twenty years! They’ve just announced their 20th Anniversary Tour will start next Spring. They’ll travel across the US, be in Boston for three St. Paddy’s Day shows, then over to Ireland, then continue the tour through Europe.